Midwest to South Korea: You Have a Drivers License?? 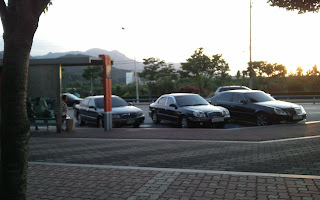 I originally started this post months ago but somehow it fell by the wayside, not sure how that happened...it's not like I've been busy teaching, traveling and living... but there's a new reason for me to come back to this post, I have something more to add and so here it goes - driving in Korea. watch out. When my students and co-workers found out that I not only had a drivers license back home but have been driving since the age of 16 they were amazed. "Wow you can drive?! Are you a good driver? "...I likely just responded with a blank stare - umm yeah? 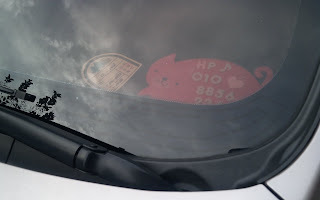 I know there are boundless stereotypes out there that Asian drivers are terrible, before living in Korea I took that all with a grain of salt and let it roll of my back - I mean I am from Wisconsin where we have to deal with the FIB's from the south (now those are some terrible drivers). 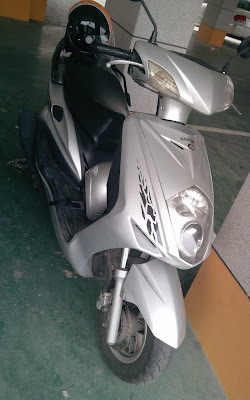 However, after moving here I have a new appreciation for what bad driving really entails - let me break it down: parking, public transportation and of course the scooter. 1. Parking - so as you can tell in the above picture, you can pretty much park as you please here. I guess this isn't too far out, I remember seeing the same thing in the Netherlands two years ago, and i'm sure it occurs elsewhere. 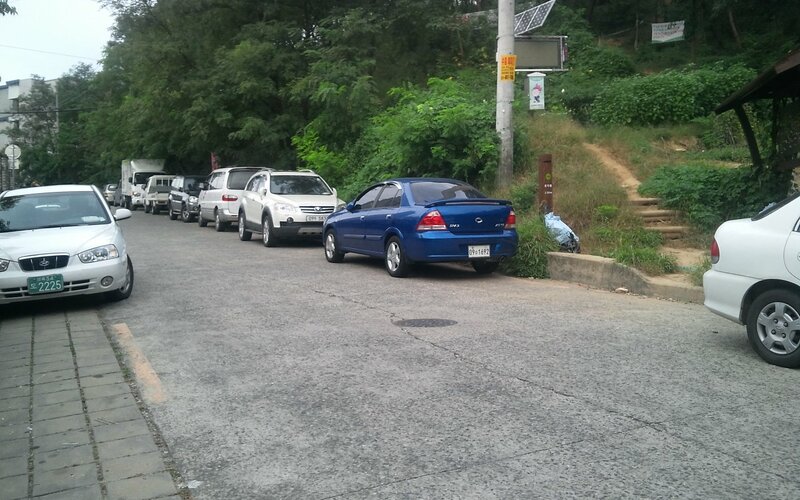 This is nothing though, if there are any parking rules here in Korea i'd like to know who cares enough to enforce them. It makes me laugh when I continually see friends at home complaining about parking tickets or getting towed. 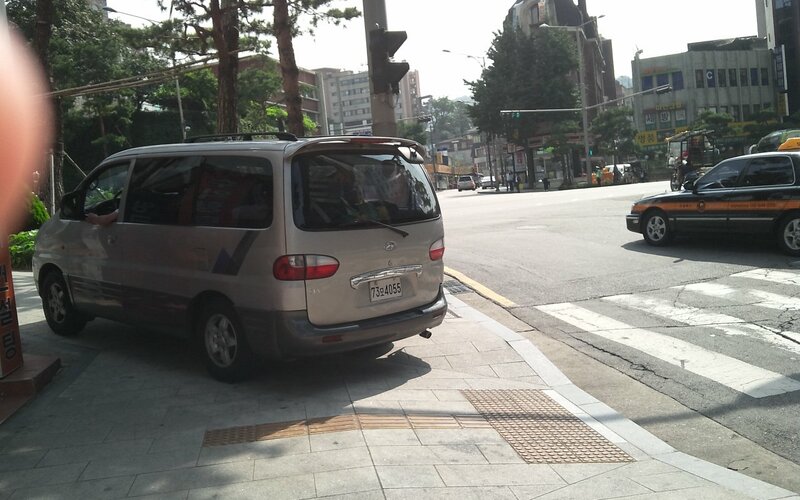 So you would think the lack of rules would cause problems, but Korea is one step ahead of you. First of all, if you're going to park in an inconvenient spot just make sure to leave your car in neutral so someone can move it if they need to. You think i'm kidding? But, if you're unable to give it a little push and open up enough room for yourself, don't fret - there's a second option. All cars have the owners phone number displayed in the drivers side window, just give them a quick call and they should come out to move it for you. Seriously this is genius (well aside from the fact that your number is now on display to the world - but I haven't heard anyone complain about it.). But back to the point of parking - like I said, anywhere is fair game...parking lots are packed, double parking is A okay, sidewalks are a reasonable place to stop, and yeah even bus stops make for a good spot to park your car. 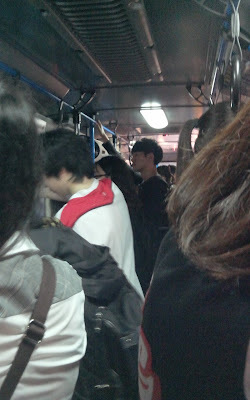 Speaking of buses....I have a love/hate relationship with the buses of Korea. On the bright side they're cheap, fairly dependable, come on a regular schedule and easy to navigate. That's the good - but the bad, oh the bad...if you're taking a city bus cross your fingers that it's not the express bus which have fewer seats leaving the majority of passengers standing, holding on for dear life as you speed through the narrow streets. Seriously I've almost wiped out a few times, almost taking a few ajummas with me. Sometimes I feel like the drivers get a joy out of watching the passengers struggle as they speed up to a red light only to, seconds later, slam on the breaks - this also does little to help my motion sickness. Oh, and you might want to avoid the front seat, similar to the front row of a roller coaster you get the full ride excitement. I can't forget my other favorite form of public transportation, the taxi. Seriously I don't think there can be a taxi ride in Korea that isn't full of adventure or produces a good story. There's the drivers that see a foreigner (or two) in their back seat and immediately want to practice their English or the ones that think because I can tell them where to go in Korean that i'll understand 100% of their speed talk, but then there's the ones that you can tell are thinking "damnit I got the foreigner". No matter which driver scenario you get you can be guaranteed of one thing - the ride will be fast, you'll be wishing you had buckled your seat belt, and upon arriving at your destination may be wondering how you made it alive. Scary or exciting, depending on how you look at it, taxis in Korea are cheap and efficient, albeit a little dangerous. As if the fact that I have a drivers license and drove a car in the United States wasn't enough to blow my Korean friends minds, I decided to take it one step further. Shortly after committing myself to a second year I decided to make life easier and bought a scooter. 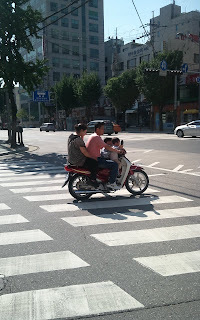 Yep, I joined the ranks of crazy Korean drivers, but don't worry at least I wear a helmet - and try to abide by some rules. The news of my purchase spread faster than wildfire through my school and I was soon greeted with "I hear you bought a scooter", "Wow, you are so strong" and "Oh you know how to drive a scooter, that is so difficult, how did you learn???" I left out the fact that the first time I ever drove one was the day I bought it...then they're really think i'm crazy. By far though, the best comment I've received came from my Korean friend 동필, "Wow, you must surprise people...only ajummas drives scooters so they must think you are ajumma but then they see little white girl, so funny!" So I guess if nothing else my scooter is good for giving the Koreans one more reason to stare, point and maybe even laugh at me. You're welcome.